Week six of the NFL 2016 season is now over, there were many great games to watch this past weekend with results no one could have guessed. Teams are starting to show their true colors through six weeks, and we now can see who are the contenders and others who are just pretenders. But overall it was another great week of football in the NFL. Here are the game recaps for this past weekend. Game Recap: This week started off with a big upset in the form of the Chargers defeating the Broncos on Thursday Night football. Color rush was in full form again this week, I am a uniform nut so usually I am excited to see what teams break out for this, unfortunately I was not impressed as both teams had terrible uniforms and it turned out to be an ugly game. The Chargers took the lead from the beginning and held it off until the end as they were able to snap a 10-game winless streak in the division. The Chargers were finally able to play consistently and complete a full game in route to defeating the defending super bowl champs. The Broncos did not look good in this game as they were beaten up by this struggling Chargers team. The Broncos loss puts them back to 4-2 and opens up the AFC West which they have dominated as of late. Player of the Game: Rookie TE Hunter Henry dominated this game in route to 83 yards receiving and a touchdown for the Chargers. Game Recap: This week’s ‘Game of the Week’ lived up to its billing as the Seahawks were able to edge out the Falcons in Seattle. The Seahawks showed that they continue to be one of the few powerhouse teams in the NFC and they will not back down from anyone no matter who they beat the week before. The Falcons came in with the top offense in the NFL while also putting together some impressive wins over the past few weeks, but ultimately they came up short against the Seahawks. Matt Ryan continued his amazing run of form throwing for 335 yards and three touchdowns. The Falcons were almost able to mount a comeback as they rattled off 21 third quarter points to eventually take the lead, but came up short in the end with a field goal by Steven Hauschka with 1:44 left in the game. The Seahawks were led by Russell Wilson and the defense. Wilson looked poised and in control from start to finish, willing his team to victory. 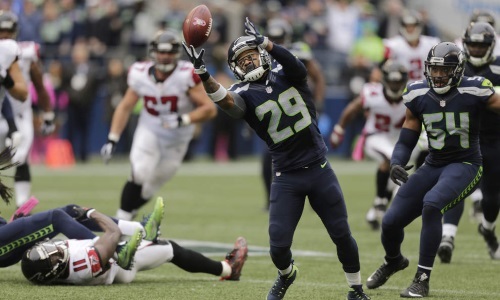 This is a great win for Seattle as they continue to dominate the NFC and show they are still the team to beat. Player of the Game: Seattle Defense for stopping the Atlanta offense for most of the game. Yes, they gave up 21 third quarter points, but they were able to get the win in this game against a dominant Falcons team. Game Recap: The return of Colin Kaepernick went as predicted by me last week, a loss for the 49ers at the hands of the Bills. Kap had little impact and proved that the Kelly experiment in the NFL is broken. Kaepernick and Gabbert are not bad quarterbacks, they are just playing without weapons and in a system that works in COLLEGE FOOTBALL, not in an NFL with professional players who are disciplined and can predict plays. I am not blasting the quarterbacks this week, I am blasting the coaching of the 49ers, Kelly should be fired and his career over in the NFL. I would love to see him go back and dominate college football, he needs to realize that his system is better used somewhere else. The Bills looked great in this game and continue to impress as they ride this four game winning streak. Player of the Game: LeSean McCoy was dominant again as he rushed for 140 yards and 3 touchdowns to lead his team to victory. Game Recap: A game in which two teams in search of any win they can get ended in the Jaguars favor this week in Chicago. The jaguars were able to come from behind and steal the victory away from the Bears. The Bears completely collapsed in this game after leading in the fourth quarter 13-0. Hoyer continued to impress as he threw for his fourth straight game of 300 yards through the air. Unfortunately he was not able to get any Touchdowns through the air and that was the difference in this game as the Jaguars were able to get those points they needed to win. Bortles looked much improved in the fourth quarter guiding his team back into the game and ultimately the win. Both teams are not top-tier and still need a lot of work to get more wins this season. Player of the Game:. Bortles was able to find Arrelious Benn for the go-ahead score in the closing minutes of the game and this earned him the player of the game honors for this comeback victory. Game Recap: A tale between two offenses. Wait…What? Offenses? Am I talking about the Rams? Yes I am talking about the LA Rams who came on fire this week as Case Keenum was able to throw for 300+ yards through the air and 3 touchdowns to lead his team. Unfortunately for him, Stafford was more impressive in throwing for 270 yards and 4 touchdowns and the Lions were able to grab a victory over a talented Rams team. The Lions are now riding a two game winning streak and look to bounce back and close the gap between them and the Packers in their division. Player of the Game: Golden Tate finally had his breakout game of the 2016 season with 165 receiving yards and 1 touchdown. Game Recap: A game in which many thought would be a one-sided affair in favor of the Steelers, ended up being completely the other way. The Dolphins dominated from start to finish in route to a strong win over the Steelers at home. Roethlisberger did not look himself this week as he did not connect with his receivers well. Big Ben also tore his meniscus in this game and is set to miss at least one week of action after having surgery yesterday. The Steelers have struggled with consistency this season and have showed up for the big games, while disappearing for games that should be easy wins for them. The Dolphins behind Tannehill finally got things going in this one. Jay Ajayi dominated on the ground for the Dolphins in route to 204 yards and 2 touchdowns. The Steelers had no answer for this Dolphins offense and on the other side their pass rush. Great win for the Dolphins that will hopefully get them back on track to salvage this season. Player of the Game: Jay Ajayi with 204 yards rushing and 2 touchdowns is the easy pick for player of the game. Game Recap: Business as usual for the Patriots this week as they took care of a pesky Bengals team at home. Brady made his first start this season in Foxborough and wasn’t going to disappoint the home crowd. Brady looked flawless (when doesn’t he) in this game in route to a strong win for his team. The Patriots are continuing to roll through opponents and do not look to stop any time soon. The Bengals have not had the best of starts this year as they fall to 2-4 on the season. The Bengals are talented, but need to win games like this to prove that they belong with the league’s elite teams. Game Recap: The Panthers have lost their swag….COMPLETELY. The Saints got a statement win this week over the Panthers to improve to 2-3 on the season. The Panthers came to town as heavy favorites over the Saints, but after falling behind 21-0, the Panthers could never fully recover. They came back in this game to tie the score, but the result was never in doubt as the Brees-led Saints closed this one out with 11 seconds left with a field goal by Will Lutz. The Panthers need to figure this out, it looks as if the season is over for them as they have completely self-destructed this season. Cam Newton looks disengaged and passion-less this season (losing will do that to you) and it has translated on the field as his team lacks a leader. The Panthers have the talent to compete with the best, but ever since that Super Bowl loss, they have not looked the same. Player of the Game: With many contenders for this honor, I could only give it to one man, Drew Brees. He threw for an astonishing 465 yards and 4 touchdowns through the air to earn his team the win at home. Game Recap: The return of OBJ. Odell Beckham Jr. had his breakout performance of the 2016 season, absolutely torching the Ravens for 222 yards and 2 touchdowns receiving. A game in which the Giants desperately needed to win as they had already dropped three straight games, they were able to do what was needed in order to grab this win at home. Eli Manning had a great game through the air as well throwing for 400+ yards. The Ravens looked to control this game at the start, but as soon as OBJ was released upon their secondary, this game was out of reach. Both teams go to 3-3 on the season and look to improve going forward. Player of the Game: OBJ had a monster game with 222 yards and 2 touchdowns. Game Recap: Marcus Mariota showed why he was the 2nd overall pick in the draft a year ago as he led the Titans to victory this week against Cleveland. Say what you want about their 0-6 start, but the Browns fight hard and teams are not really blowing them out. The Titans had to earn this one, and they did in the end topping the Browns at home. DeMarco Murray had his least impressive game for the Titans yet this season, but was still able to grab a touchdown on the ground for his team. The Titans have already matched their win total from last year and look a much improved team so far this season. Player of the Game: Marcus Mariota threw for 284 yards and 3 touchdowns, and ran for another 64 yards on the ground. Game Recap: The Redskins are continuing to impress this season as they extend their win streak to four games after a victory over the Eagles at home. Kirk Cousins has looked like a different quarterback over the past four weeks in route to grabbing win after win for his team. The Redskins ride or die on the performance of Cousins, so as he continues to play well, expect them to deliver wins. The Eagles were not strong again this week in route to their second loss of the season. The Rookie Wentz had a rough outing, throwing only 179 yards and no touchdowns in this game. This division is a tough group this season and it will be exciting to see what happens as the season unfolds. Player of the Game: Kirk Cousins continues to play well after stinking it up in the first two weeks. He threw for 263 yards and 2 touchdowns in route to a win for the Skins’. Game Recap: A bounce back win for the Chiefs this week as they traveled to Oakland and defeated the Raiders. The Chiefs picked apart the struggling Raiders defense on the ground and through the air in route to a much needed win. Prior to this game, the Raiders had looked more and more like one of the teams to beat in the AFC but with a poor defense sooner or later their impressive run was going to end. The Chiefs bounce back after the bye week and hope to continue their offensive strong play in the weeks to come. Player of the Game: Spencer Ware had 131 yards on the ground and a touchdown in a career performance for him in the Chiefs win. Game Recap: HOW BOUT THEM COWBOYS?!?! The Cowboys went into Green Bay and got a win against a strong Packers team. By the way that things went this week, you would have thought that Prescott was a Super Bowl winning quarterback and Rodgers was the rookie. The Cowboys dominated on both sides of the ball in route to a statement win this week as they go into their bye. The Cowboys were led by Rookie Running back Ezekiel Elliott who had a career high 157 yards on the ground to continue his strong play. Dak Prescott made a strong case this week that he should be the undisputed starter even with a healthy Romo back. Player of the Game: Prescott played well throwing for 247 yards and 3 touchdowns. Game Recap: A thriller in south Texas as the Texans were able to edge out the Colts in overtime this week on Sunday Night Football. Through three quarters, the Colts were dominating this game, but the Texans played strong in the fourth to eventually tie the game and got the win in overtime. Half way through this game, people were calling for Osweiller’s job, but he was able to rally his team and get a divisional win this week. Luck did everything he could to get his team to win, but ultimately fell short in this one. Player of the Game: Lamar Miller had his first touchdown of the season along with 149 yards to dominate in this game. Game Recap: The Cardinals looked unstoppable this week on Monday Night as they completely dismantled the Jets to get the victory in Arizona. The Cardinals are now back at .500 for the season and look to improve from there. David Johnson looks like the best back in the league with another week of multiple touchdowns. Watch out people, this Cardinals team is beginning to believe again. The Jets looked horrible and their streak of poor form continues. If this keeps up, look for Geno Smith to lead the charge in the weeks to come. Player of the Game: David Johnson with 111 yards and 3 touchdowns on the ground is an easy pick here. Look for my game predictions for week 7 this Thursday as we begin another week in this exciting season of the NFL. What do you believe will be the biggest upset in week 7? Thanks for reading and I’d love to hear and read your comments on this week’s games and recap.